What a year! 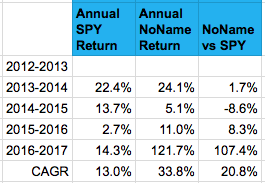 My portfolio is up 121.7%, bringing my CAGR to 33.8% since I started investing four years ago. I'll never match this performance again so let me enjoy this while I can. 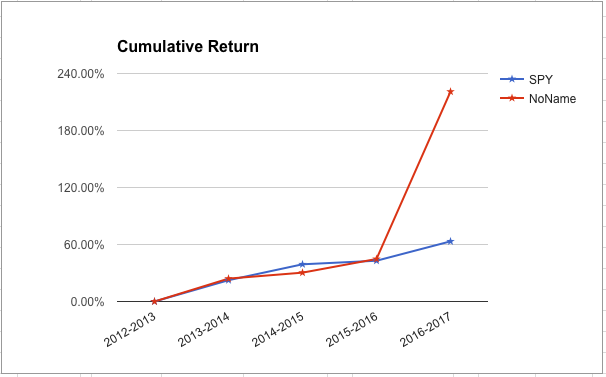 I have two goals in my investing: to make a 12% annual return and beat the market. I measure "the market" by the S&P 500 ETF SPY. The performance I quote here is my real portfolio performance and this is my entire investable portfolio. I manage the retirement funds for myself and my wife which we have spread over a few IRAs and a 401k. I also manage some after tax money we used to have sitting in a bank. Luckily I am allowed to buy individual stocks with most of my 401k. So when I talk about "my portfolio" I am talking about the 98% of my retirement funds which I'm allowed to buy stocks with plus the 85% of my savings I don't have sitting in a bank. I don't buy any bonds, mutual funds, or ETFs, just the cheap tiny companies I blog about. 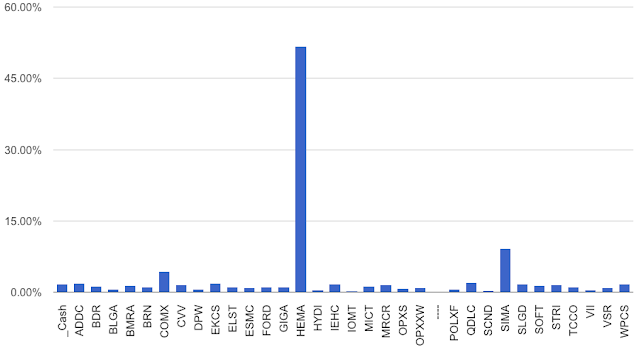 Of course I have many stocks that are down this year as well. That's life. I have not sold any of them as I think they're cheap. I guess time will tell if I'm right. MICT, GIGA, and SOFT are all down about 40%. VII is way down from my buy price as is STRI. The list goes on. Awesome! As for HEMA being a huge part of your portfolio now: trust your own research and stick with it if it still seems like a winner fundamentally. "Don't trim the flowers and water the weeds" to loosely quote Peter Lynch. Stick with the other ones in your portfolio too, they just need more time to develop. Ben Graham and Warren Buffett would approve of your choice of companies and subsequent performance. Can I take a guess at what the mystery stock is? LOL. I've been sitting here trying to make the connection and coming up with nothing. I even re-read the company information section of the latest 10k. HA! LOL. OK no worries. Because if we were talking about the same company, it would be obvious. Hahaha. OK second guess. Are we perhaps mining for gold??? Well, the only clues I have are that it lies between OPXXW and POLXF and that it files a public 10-K. I'll give it my final shot with a couple of guess. Either we're into pharmaceuticals, following Buffett into the airline business or going to Canada. I'm outta guesses after that. Lol. Lmao. I look forward seeing what it is when you disclose it. I thought I covered that part of the alphabet fairly well too. Will lose sleep over this. Lol. btw, "latest 10k" may or may not mean they currently file a 10k. I see. What do you figure your risk reward ratio on this one is? I.e. Downside is how much and what's the probability and the same for upside. You are looking at this mystery stock much harder than I expected. And you've probably already spent more time on it than me. It's just small and cheap and they had some interesting language in a filing (OK so they do file). Has potential but it's not one of the crazy cheap ones like SIMA. I really haven't thought about it too much. It fits my style so I'll buy some shares then come back to it.